WAIT [mention]SIXX[/mention] million seconds That's the third name I've seen in your handle today, lmfao. And prior it was Razzi X for a lot of minutes! Mods change Tina’s name to Phil Palmer! All the finalists are great but am voting for Razzi X. Up to 4x using each method! 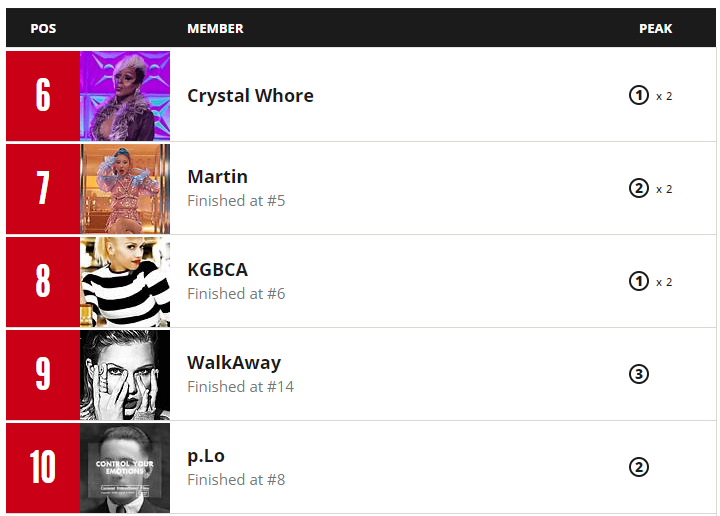 Despite being a finalist [mention]Crystal Whore[/mention] is the only member of the final four who didn't place within the Top 5 overall. His impressive performance of hitting #1 twice was let down by his slow burner peak. He first reached the Top 5 in Round 4 and maintained a Top 10 streak to remain a contestant in SMFXRM. [mention]Martin[/mention] held a consistent track record just outside the Top 5 for the majority of the Rounds, peaking at #2 after Excelgate. The sympathy sales! He was eliminated at #5, missing out on the finale. [mention]KGBCA[/mention] similarly to Crystal Whore peaked at #1 and did that twice, but due to erratic time schedules, suffered when he wasn't able to promote leading to a few placements just outside the Top 10 which threw off his average. [mention]WalkAway[/mention]'s performance is most impressive, becoming the only member to chart Top 10 overall despite being eliminated outside of the Top 10 in the actual game. He peaked at #3 in the very first round, but with Demons focusing on other members temporarily, sadly fell off after a surprise attack from The Royals. [mention]p.Lo[/mention]'s performance was controversial as he avoided elimination at the last second during most of his final rounds. He originally placed #7 but after HeX was brought back for the Wildcard, he was moved to #8. THE OVERALL TOP 5: DINVY, HEX, TINA (#1 Lotus Fan), QUEEN RAZZIBERRY (Razzi X) & MALEFICENT. WHO DO YOU THINK IS AT #1 OVERALL? FIND OUT TONIGHT BEFORE THE VOTING IS CLOSED AND WE CROWN OUR WINNER! Ok!!! Not my run being akin to the moves like jagger UK chart run / I’m Yours infinitely slaying the top 100. I sort of won and was sadly foiled by the Royals pulling an Epic records with the discounts / remixes / payola to end me!